Cabbage rolls are a widely known dish in many European countries – Russia, Belarus, Ukraine, Poland, Germany and probably other too. I grew up eating Golubtsi, which is how we called them in our Belarusian family. This was something I learned from my mother, that she learned from her Mother and so on. Someday, I will share the recipe with my own children too. This is our version. Even though it is time consuming to make, it’s totally worth it, because the leftovers taste amazing and freeze perfectly too. I always make a huge pot of cabbage rolls, because if I am going to go to all the trouble of making them, I want my effort to really count, so I freeze half, and the other half we eat for dinner and leftovers the next day. 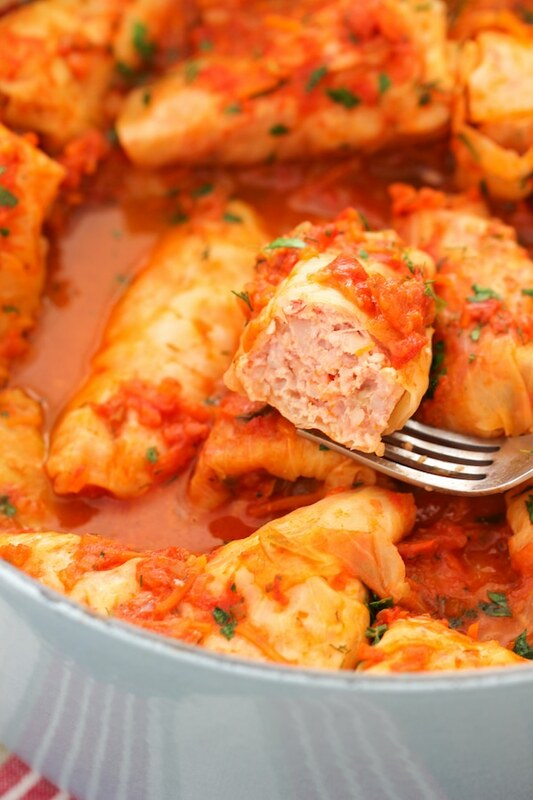 Some people are adamant that true cabbage rolls should be made with only cabbage and meat. Well, I’m not a traditionist and don’t mind making additions or subtractions as long as the end result makes my taste buds happy. I am not a big fan of eating just cabbage and meat, so I add other ingredients that add another dimension of seasoning to the dish. 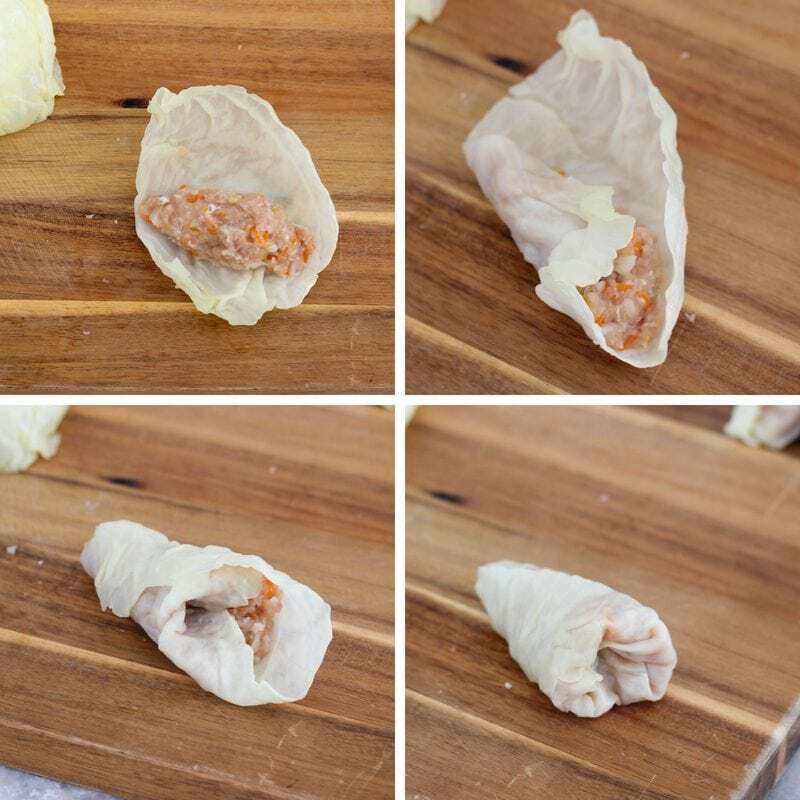 For the meat filling, I combine ground meat (ground pork and/or ground chicken are my favorite), rice, onions, carrots , celery and finely minced cabbage and wrap it all around a cabbage leaf. By adding all these other ingredients, the meat filling is tender, juicy and packed with savory flavors. Layering the cabbage rolls in between more carrots and onions, I also use a tomato sauce to cook them in. 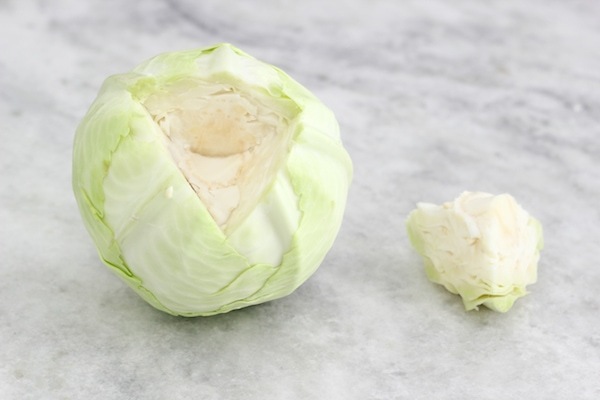 As they simmer in this aromatic sauce, all the components meld together and create one yummy cabbage roll, that’s SO good with a dallop of sour cream and a slice of Black Bread. For one full dutch oven (mine is 6 quarts) of cabbage rolls, I use 1- 2 cabbage rolls. 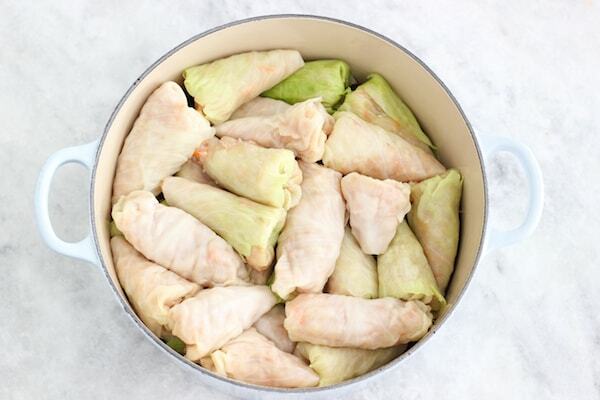 You will need 1 large cabbage roll, about 3.5 pounds or 2 smaller cabbage rolls, about 1 1/2 – 2 lbs each. Sometimes the leaves are misshapen and hard to form into cabbage rolls, so getting 2 cabbage rolls is usually a good idea. Cut out the core from the center of the cabbage. Submerge the whole thing in a pot of salted water. Bring it to a boil and cook until the outer leaves are tender but not mushy. They will pull away easily from the cabbage. 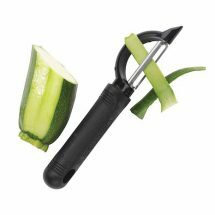 (I use tongs to pull the leaves away from the cabbage onto a nearby plate.) You want the leaves to be pliable enough to work with but not falling apart. Take apart the whole cabbage, peeling/separating each of the cabbage leaves as soon as it’s soft enough to come away from the cabbage head. Save the water. When the cabbage is cool enough to handle, cut off the hard rib on each leaf with a paring knife and discard the ribs. At the very center of the cabbage, the leaves will be too small to use. Chop up that cabbage very finely and add about 1/3-1/2 cup to the meat mixture. Coarsely chop the rest of the cabbage that you won’t use to roll into golubtsi and set aside. 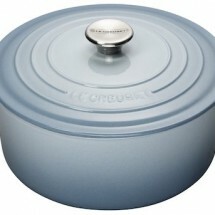 You can use it to line the bottom of the pot or to cover up the cabbage rolls. 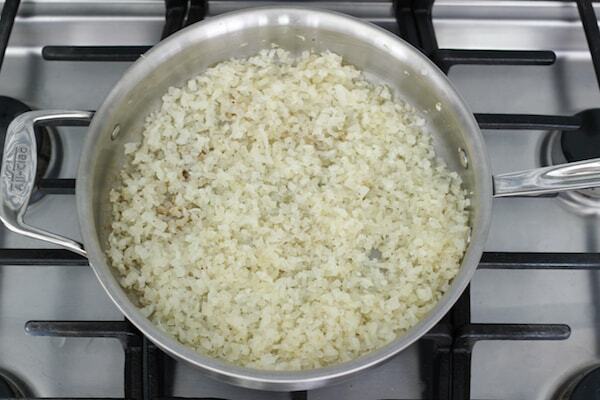 Cook the rice according to the package instructions, leaving the rice slightly underdone, drain and set aside to cool. Meanwhile, make the meat mixture. Heat the butter or oil in a skillet and add the onions. Season with salt and ground black pepper. Cook until the onions are tender. Add the carrots and celery, season with salt and ground black pepper and cook for about 5-7 minutes, until all the vegetables are tender. 1/3 of the vegetables will be for the meat mixture, so cool them slightly, just until they are warm. 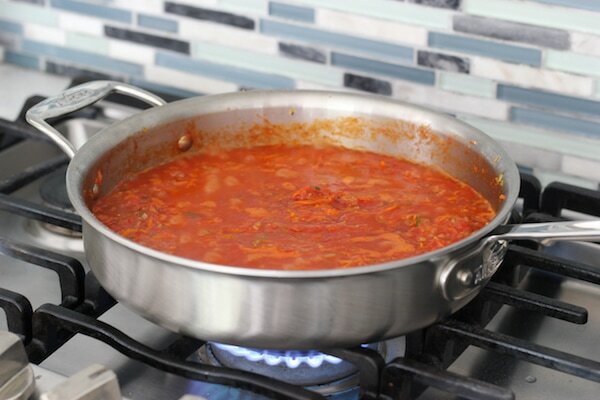 The other 2/3 of the vegetables will be for the sauce, so leave them in the skillet and add the tomato sauce or tomato ragu to the skillet, heating it through for about 5 minutes. Mix the ground meat, mixture, finely minced cabbage, rice, 1/2 cup water, 1/3 of the sautéed onions, carrots and celery, 2 1/2 teaspoons of salt, and 1 teaspoon ground black pepper. If the meat mixture feels very stiff, add a little bit more water. The meant mixture should be soft but stay together. If it feels very stiff, the cabbage rolls will be dry. 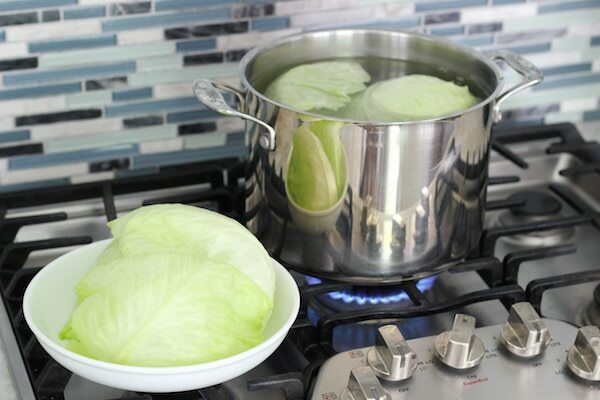 For the smaller cabbage leaves, take a small portion of the meat mixture and place it in the center of a cabbage leaf. Fold the side edges over the meat. 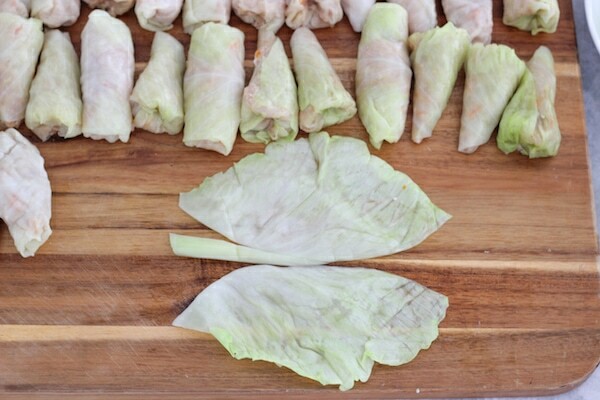 Starting from the folded over cabbage leaf closest to you, roll up the cabbage leaf over the meat to form a roll. 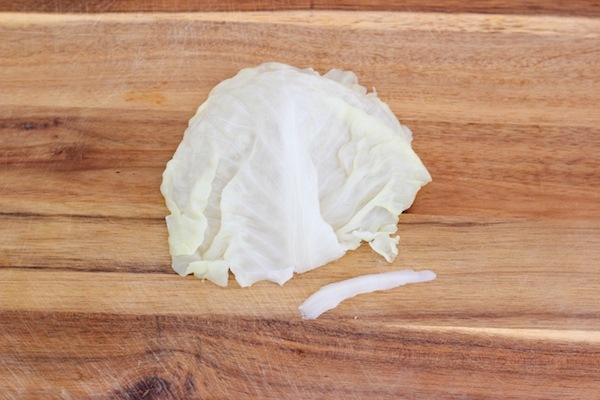 For the larger cabbage leaves, cut the leaf in half, removing the tough center rib. 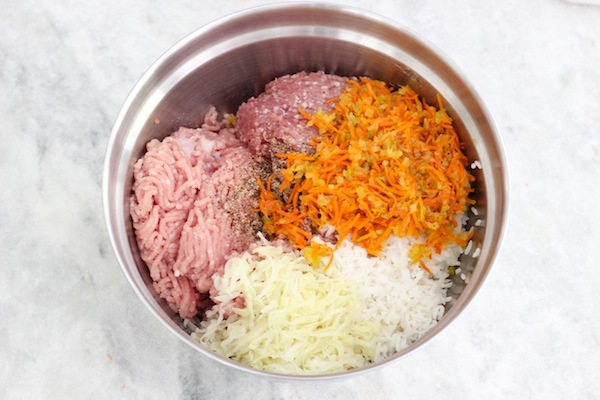 Place a small amount of meat mixture into the center of the meat, rolling it up into a triangular/cone shape. Repeat with the rest of the meat and cabbage. As you can see, I have 2 different shapes of cabbage rolls, depending on the size of the cabbage leaf, big or small. I get about 40 small cabbage rolls. I often use the same meat mixture and fill some bell peppers with it too and cook the stuffed peppers along with the cabbage rolls. The bell peppers give a great flavor to the cabbage rolls too. 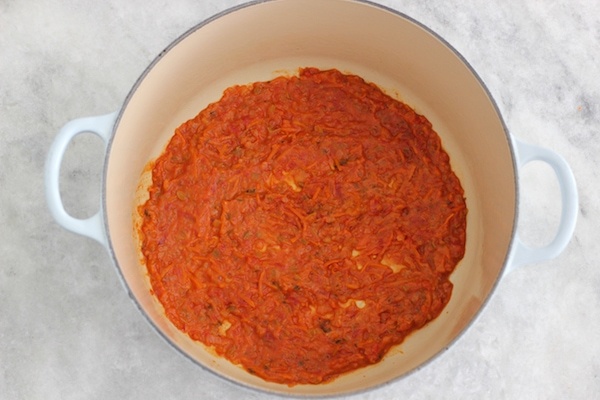 Spread some of the tomato and vegetable sauce on the bottom of the pot and add some of the coarsely chopped cabbage. Place the cabbage rolls in a tight, single layer over the sauce. Continue layering the cabbage rolls into the pot. Pour the rest of the tomato and vegetable sauce over the cabbage rolls. 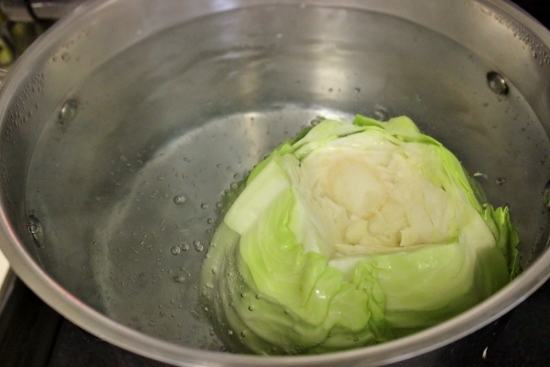 Pour about 1 – 1 1/2 cups of the reserved cabbage water over the cabbage rolls and the sauce. Place some of the leftover cabbage leaves over top of everything, if you want to. Bring everything to a boil then reduce the heat to a simmer and cook, covered, for about 1 hour on the stovetop. You can also cook the cabbage rolls in the oven, at 350 degrees Fahrenheit, for about 1 1/2 hours. Garnish with fresh herbs and serve with sour cream. Cut out the core from the head(s) of cabbage. Submerge the whole thing in a pot of salted water. Bring it to a boil and cook until the outer leaves are tender but not mushy. They will pull away easily from the cabbage. You want the leaves to be pliable enough to work with but not falling apart. Take apart the whole cabbage, peeling/separating each of the cabbage leaves as soon as it's soft enough to come away from the cabbage head. Save the water. 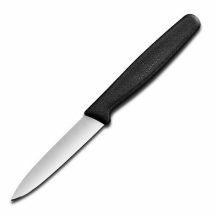 When the cabbage is cool enough to handle, cut off the hard rib on each leaf with a paring knife and discard. At the very center of the cabbage, the leaves will be too small to use. Chop up that cabbage very finely and add about ⅓-1/2 cup to the meat mixture. Coarsely chop the rest of the cabbage that you won't use to roll into golubtsi and set aside. 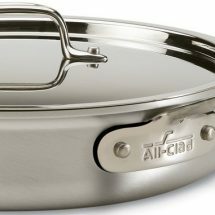 You can use it to line the bottom of the pot or to cover up the cabbage rolls. Meanwhile, make the meat mixture. Heat the butter or oil in a skillet and add the onions. Season with salt and ground black pepper. Cook until the onions are tender. Add the carrots and celery, season with salt and ground black pepper and cook for about 5-7 minutes, until all the vegetables are tender. ⅓ of the vegetables will be for the meat mixture, so cool them slightly, just until they are warm. The other ⅔ of the vegetables will be for the sauce, so leave them in the skillet and add the tomato sauce or tomato ragu to the skillet, heating it through for about 5 minutes. 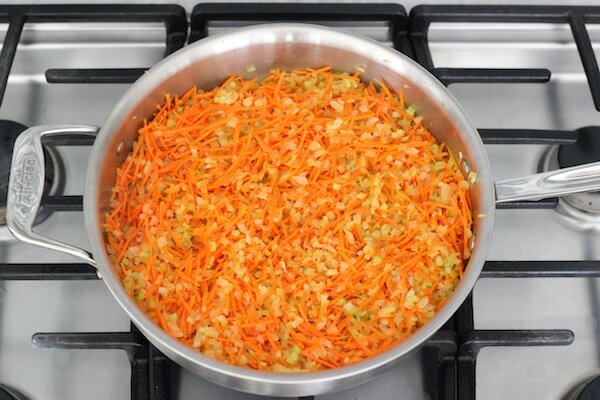 Mix the ground meat, mixture, finely minced cabbage, rice, ½ cup water, ⅓ of the sautéed onions, carrots and celery, 2½ teaspoons of salt, and 1 teaspoon ground black pepper. If the meat mixture feels very stiff, add a little bit more water. The meant mixture should be soft but stay together. If it feels very stiff, the cabbage rolls will be dry. Repeat with the rest of the meat and cabbage. I often use the same meat mixture and fill some bell peppers with it too and cook the stuffed peppers along with the cabbage rolls. 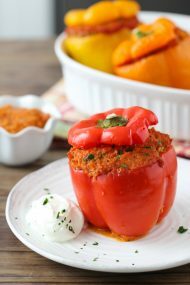 The bell peppers give a great flavor to the cabbage rolls too. 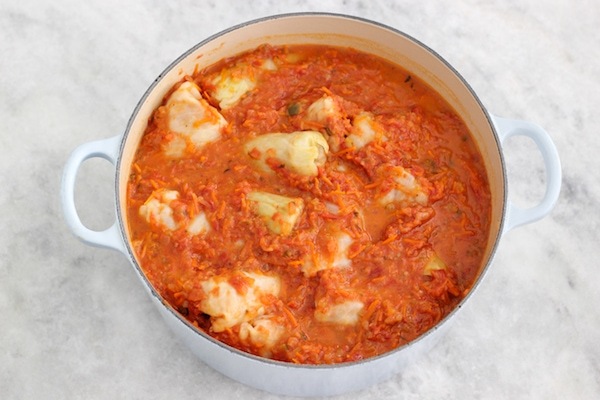 Spread some of the tomato and vegetable sauce on the bottom of the pot and add some of the coarsely chopped cabbage. 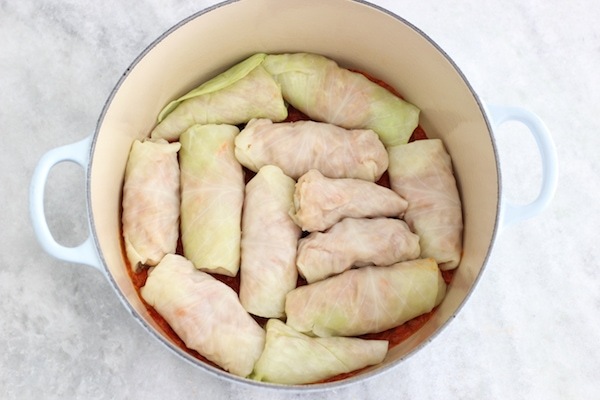 Place the cabbage rolls in a tight, single layer over the sauce. Continue layering the cabbage rolls into the pot. Pour the rest of the tomato and vegetable sauce over the cabbage rolls. 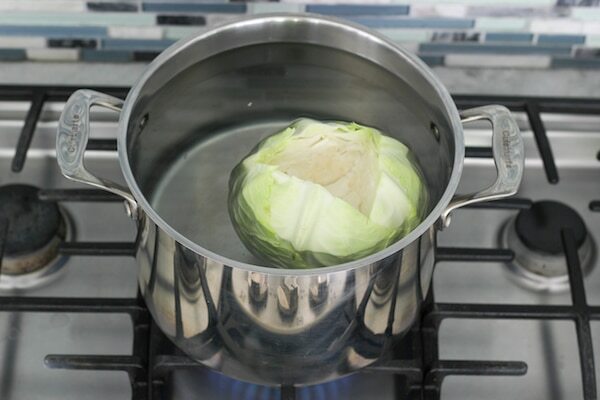 Pour about 1 - 1½ cups of the reserved cabbage water over the cabbage rolls and the sauce. Bring everything to a boil then reduce the heat to a simmer and cook, covered, for about 1 hour on the stovetop. 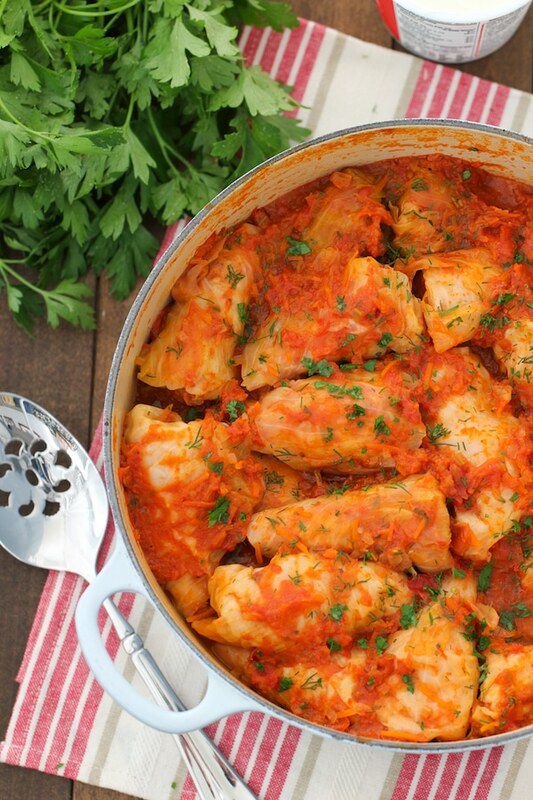 You can also cook the cabbage rolls in the oven, at 350 degrees Fahrenheit, for about 1½ hours. 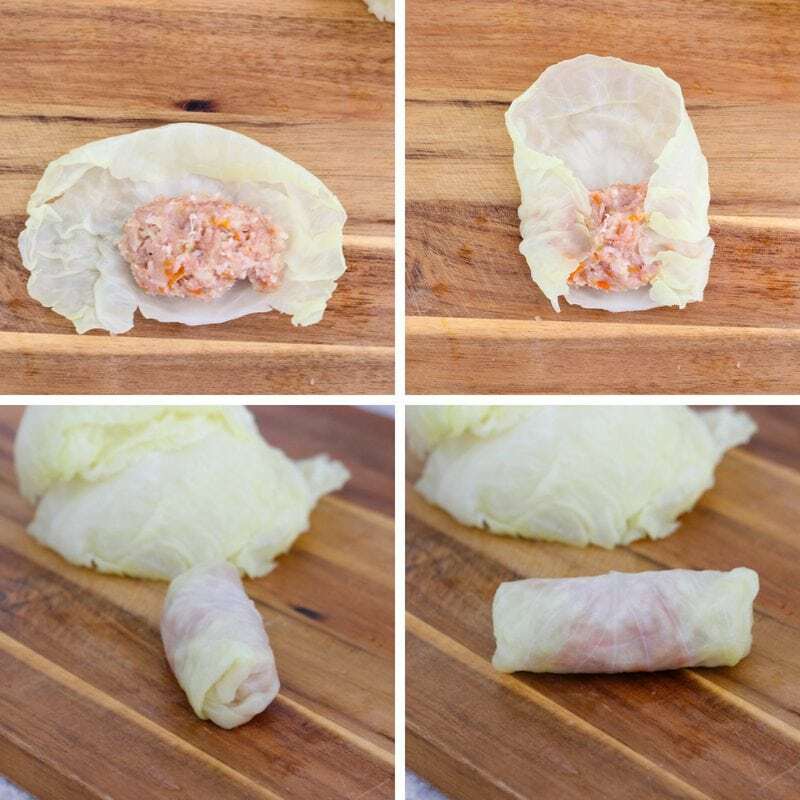 Freeze the cooked cabbage rolls in a tightly sealed container/freezer bag for up to 6 months. Thaw and reheat in the oven at 350 degrees Fahrenheit oven for about 30-40 minutes, until bubbling and hot. You can also reheat in a skillet or a pot on the stovetop. You can make this with any kind if meat that you like. I prefer pork, but I’ve made them with turkey and chicken too. I’venever made them with beef, but I’m sure if would work too. I make with beef almost all the time i make glolubtsi. You just have to cook longer. 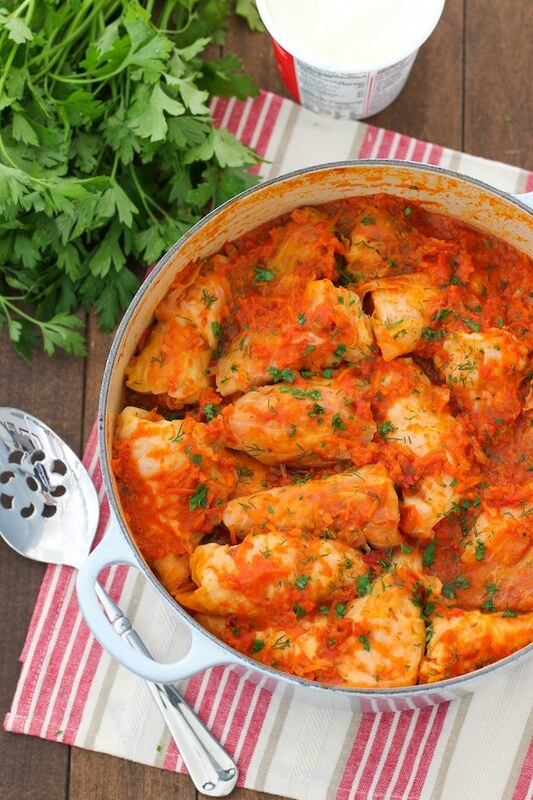 Also, Olga, try this: Cook golubsti for 40 minutes without tomatoes, just water, than add tomatoe puree. 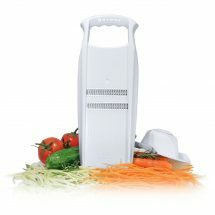 The reason: tomatoes have sourness to it, and will not let golubtsi cook faster. Also one tip: warm tomatoe puree on the skilet add a tablespoon of a sour cream and than add to your golubtsi after they ve been cooking for 40 minutes in water, and cook another 30-40 minutes. You will get toatlly differently tasting golubtsi: more mild, soft version. Well this is just how we do it. :)) Everubody does it differently I guess. Thanks. I love your site and recipes. 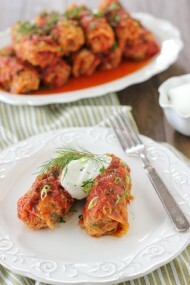 I have always wanted to know how to make cabbage rolls like this! 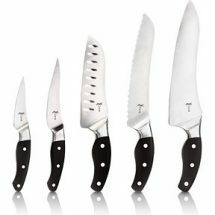 Would you mind giving me some suggestions for what you serve with them? I was thinking of preparing them for a family get-together. That’s great, Donna! 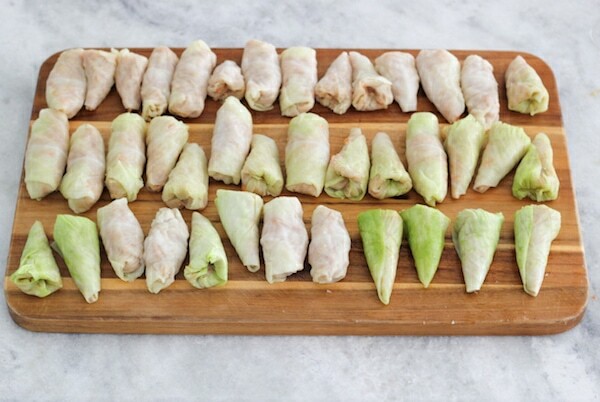 I’m so excited that you’ll be giving cabbage rolls a try. 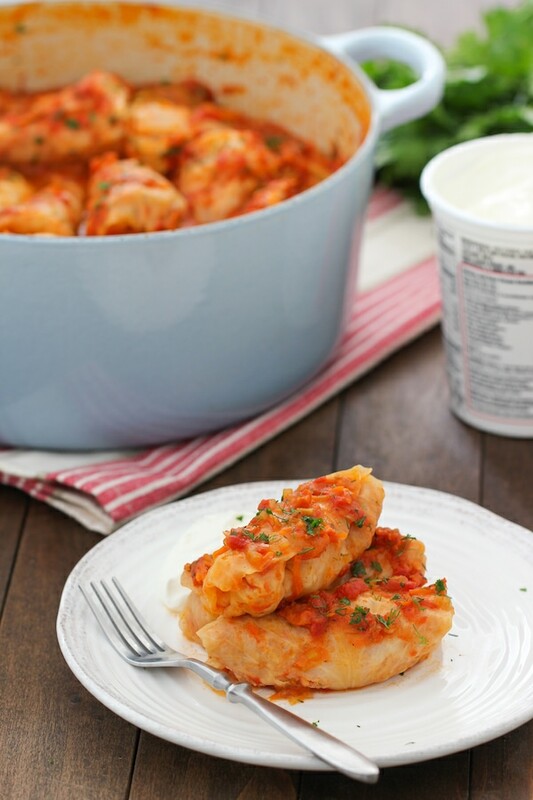 Whenever I make cabbage rolls, we serve them simply with bread and sour cream on the side. You can serve it with a salad. I usually make some sort of soup to serve as a first course. Great classic recipe! I love these warmed up the next day in the skillet, crisping the cabbage in the process. One question: do you have an easy way to print just the basic recipe? That’s a great way of reheating them, Vik. I made the Printable recipe for you. Some of my older recipes don’t have the printable recipe since I was using another program, but I am trying to change all of them to include the Printable version as well. If you see any others, please let me know. Just made these. After taking my first bite I couldn’t help but smile, as it reminded me of eating these as a little girl in Odessa. So good! My husband is very excited to try these too. I admit I was intimidated at first to work with the cabbage, but it was so easy! Thanks Olga AGAIN! Now I an making the kotleti with mushroom stuffing. My only question is: What do I do with all my Food and Wine and Bon Appetit magazines? I stopped reading them once I discovered your website. Ha ha maybe I’ll give them away. What a sweet comment, Susanna! I’m thrilled that you are enjoying the recipes:). I stopped all my magazine subscriptions a few years ago because there are so many options for recipes online. You can donate your collection to the library:). Olga, thanks for a wonderful and easy to follow recipe! My boyfriend said these were better than his grandma’s!! We really enjoyed making and eating them last night. Wow! That’s quite a compliment:). Thank you so much for taking the time to let me know. I love reading comments like yours, DCFan. Have you ever tried these in a crock pot?.how long would you cook them on low for? I did, but it was a long time ago, so I don’t remember. Sorry:). DEAR OLGA, THIS WAS MY VERY FIRST TIME TO USE PORK FOR GOLUBTSI: I’VE ALWAYS USED GROUND BEEF. BUT I LOVED THE FLAVOR OF THE SAUCE AND THE MEAT VERY WELL ! THE ONLY BAD FACTOR WAS: the filling in some Golubtsi was too Tough AND OVERCOOKED, while the Cabbage leaves stayed medium-cooked. As for the Cabbage, It was OK for me-but I didn’t understand how to BALANCE the donness of both. I definitely LOVED THE ADDITION OF 1/2 RED CHOPPED PEPPER, THAT I STEWED WITH CARROT, AND THE ONION. THANK YOU FOR YOUR ANSWER ABOUT THE TOUGHNESS OF THE FILLING. I LIKE YOUR RECIPES VERY MUCH-THEY’RE FLAVORFUL, FRESH AND HAVE THESE GREAT PHOTOS-STAGE-BY-STAGES OF PREPARATION AND COOKING THAT ARE SO HELPFUL AND FUN !! 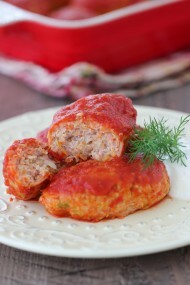 I’m so happy to hear that you enjoyed the cabbage rolls and were pleased with how tender they are with ground pork. I have to say, that I’m partial to how they taste with ground pork better than beef:). Thank you so much for taking the time to write and let me know. Hi Olga! I’m SO excited I found your website! It’s so easy to understand and everything is delicious. My apartment always smells wonderful when I’m making your recipes…I made golubtsi yesterday and am eating leftovers and they are divine the next day. I even brought some to my Russian neighbor, who said they were very authentic! That a true Russian gave me, a girl from Louisiana, THAT compliment…well, I HAD to share. Best wishes to you! Thank you so much for such a sweet comment, Heather. I really appreciate that you took the time to write. I’m so happy to hear that you and your neighbor both enjoyed the Golubtsi. (It’s such a childhood classic for me.) I still make them all the time. I hope you’ll continue to find other recipes to enjoy from this site. Hi how much onion do you caramelize by itself and how much do you cook with the carrots? thanks!! Have you tried to freeze golubtsi? If you did, what is the best way to thaw them? In a microwave? by simmering in a pot?